This is as the title suggests, a great atlas, it’s in such a large format, that if you want to use this while observing something at night, you’d better have a table for it, and since it has pretty pictures in it, a small home observatory would be also recommended, just so that His Royal Highness the Great Atlas would be pleased. I can’t imagine using it during an evening of observations unless it’s somewhere huddled in a corner of a sofa with a cup of hot cocoa and looking at the pictures, instead of freezing next to my telescope. However it would work for planning observations – it has some of the best astronomical objects one might want to observe with a small telescope and 30 constellation charts, where you can find several galaxies, clusters double stars etc. As a huge plus side – with each constellation chart, there is a plastic sheet, on which are the positions and names of some of the brighter objects, so you can turn that plastic page back and forth and learn the names of stars in constellations. I probably wouldn’t use this atlas myself. It’s more of a coffee-table book in my opinion. Plus, since it covers almost only the northern hemisphere constellations, with just 7 constellations that can be seen only in the southern hemisphere, then it doesn’t give a good overview. I’d want to say, that the objects in it would be good for someone starting to observe with a small telescope, but it’s large size would make the atlas difficult to use. 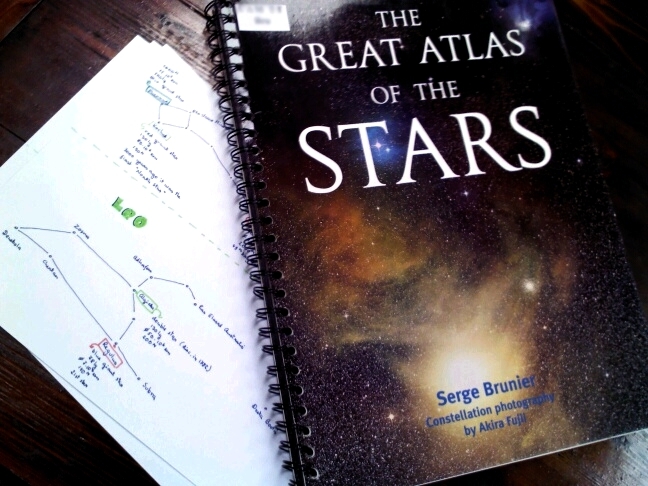 So to sum up: Pretty pictures, 30 constellation charts, huge format, basic info for some stars, galaxies and clusters. 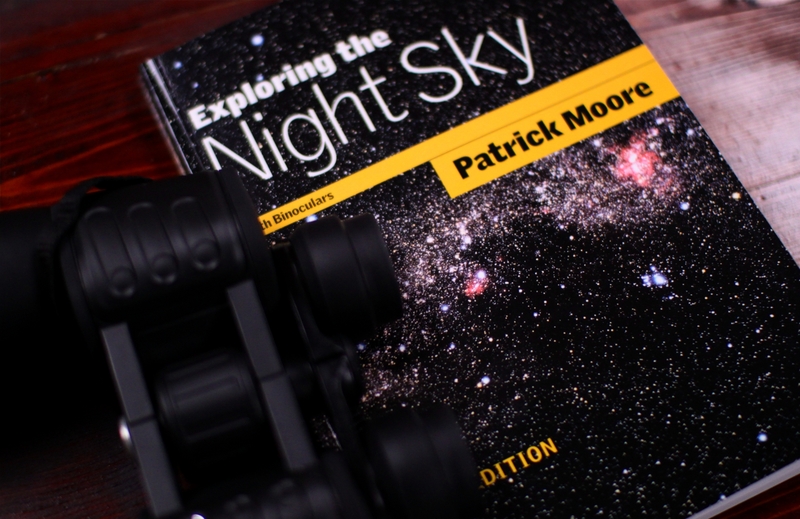 If you ever need to find something in the night-sky, then this book would probably help you. It has all the naked-eye objects and also the things for which you need binoculars, the latter being really the reason for the book’s existence. It starts out with the basics, giving spectral-types and different types of variable stars. Then there’re the brightest objects you can see using binoculars for each constellation. Reading that part reminded me of the time when I used to read English-Estonian or German-Estonian dictionaries just for fun. It stopped being fun after a couple or ten pages, and it’s a good way to remind yourself of something you’ve always wanted to do and never had the time for. Reading about all those objects was a bit like that. Since it should be actually used more as a handbook and for example for planning observations, then it’s really useful, the charts for each constellation and how to find the constellations are helpful (reminded me that I was supposed to learn the southern constellations a while back…). After the constellation guides, in which there are the brightest stars, variable and binary stars; open, diffuse and globular clusters; and galaxies, there’s also the Moon in different phases, so even for observing the Moon, it’s great. And it ends with planets, asteroids and comets, of which only the comets are something that might be interesting to look at with binoculars. 1. The magnification with binoculars is usually somewhere between 7 and 20, while with a telescope you’d usually use a magnification upwards from 30 or so. 4. It will hurt your face to hold one of your eyes shut for hours. You don’t need to do that when using binoculars or just stra-gazing without any optical instruments. So to sum up – if you’re bored and it’s daytime and this is the only book you have, you might do well to have a pillow nearby in case you fall asleep. If it’s nighttime and the sky is clear, get a red flashlight, and go outside and try to find Waldo… or Vega or Achernar. It’s a good book for people just starting to learn about the night-sky, but it’s a little beyond basics.